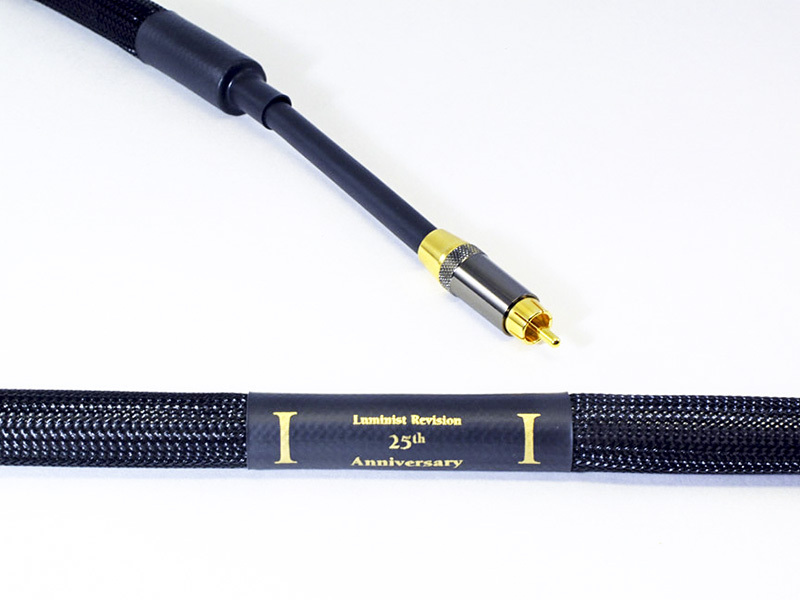 The 25th Anniversary line of Interconnects represent everything we have learned from over 25 years of hand crafting the best cables possible! Everything from the single crystal silver conductors to the advanced Ferox dampening let these cables vanish in your system and deliver the music! The slender sleek design allows for easy installation in tighter spaces! They are available in Single-Ended (RCA) and Balanced (XLR) configurations. If your system demands a custom configuration, please contact us. We're able to custom-build to fit your needs! All 25th Anniversary cables come packaged in a handsome soft case. "From the extremely quiet noise floor, small details popped out, percussion from Mussorgsky's "Pictures at an Exhibition" came from deep in the soundstage yet seemed clear as a "bell". The power of the full orchestra was easily rendered, and dynamics handled with aplomb. The system expressed detail in a perfect way, not edgy or forward, but with ease and gave the listener a relaxed sense to just listen and have fun." "These audio cables from Purist Audio Design are not only a fascinating case study in engineering, I think they sound fantastic." "Sonically, the sheer scale and dynamics of the music in this room was bloody extraordinary. The electronics might have been new to North America, but the effect was "Audio Oasis! Award material" all the way. The sound was effortless, fluid, natural, organic, and had the sort of transparency that I associate with only the finest sort of designs that I've encountered on this planet. Detail without edginess; dynamics without loss of control; full-frequency-range presentation without humps or valleys...I was really gobsmacked by what was happening..."
"...The sound quality was in the top five rooms I visited, bursting with power and grace. “Jazz Variants” performed by the O-zone Percussion Group, had everything tympanic in its proper place and all mallets striking with proper force." We were pleased to make Dave Thomas' "Top Five" list at AXPONA, in 2015! "...the soundstage...retained pintpoint imaging and sweet high frequencies. Bass was fast and taunt, avoiding both bloating and muddying up the lower midrange, resulting in superb clarity." We were pleased to make it into 3 of Greg Weaver's "Top Five" at AXPONA, in 2015! "In The Voice That Is room, Purist Audio Design’s Luminist 25th Anniversary ($55,000) cables were mated with Tidal electronics and its new Contriva G2 speakers. With music sourced from the Aurrender W20 Reference music server and Bricasti M1 DAC, and power supplied by the highly effective Silver Circle Audio TCHAIK 6 power conditioner, the finely detailed sound emerged from a very deep soundstage. The room was definitely a candidate for Best of Show."